Hinduism is a way of human life, a path of eternal spiritual discipline, the sanatan dharma. Recognizing the needs of human beings during their lifetimes, the ancient sages have put forward a fourfold ideal to be striven for by every member of the society. This is called the purusharthas or the ends to be achieved in life. They are dharma, artha, kama and moksha i.e. duty or righteousness, wealth, bodily desires and liberation from transmigratory existence respectively. Unless some higher norms and standards are prescribed there cannot be any fairness in playing the game of life to achieve these ends and as a consequence jungle law only will prevail. It is these rules or norms that go by the omnibus term “dharma” for which there is no English equivalent. For our purposes we will interpret this term as duty or responsibility or obligation. Thus dharma is made applicable to each member of the society according to the varna to which he belongs and according to his stage in life. Hinduism believes that a human being gets purified and refined by undertaking certain rites or rituals referred to as samskaras which are generally taken as sixteen in number (sodasa-sasamskaras). The Hindu scriptures do not consider birth as the starting point of life. It goes farther back since the incident of birth is primarily conditioned by heredity and parentage. Keeping this in mind, the samskaras for a person start from the time of his conception (Garbhadhana) and end with cremation rites (antyeshthi). Apart from the ceremonies to be performed every month following the death culminating in the first anniversary of the death, Hindu Dharma prescribes that the forefathers should be worshipped thereafter also. When they leave this world it becomes the Vedic duty of their descendants (sons) to worship their departed souls on a daily basis apart from the specific days like New Moon day (amavasya), Eclipse Days (grihan), Parva Kala (Uttarayana, Dakshinayana), Pushkara Days, on the specific day (thithi) of their death, on visiting any Theertha Kshetras etc. Among these rites the important ones to be undertaken by the son in honor of his deceased parents and forefathers are Tarpan on every newmoon day (Amavasya), Shraaddh on each anniversary of the deceased and most importantly the rites to be performed during the Pitrupaksh. A discerning person will naturally seek an answer to the question why at all these rituals are required to be performed. Hinduism answers this query when it says that every person who is born is under five runas or debts to his manes and others from whom he derives benefit as a member of the society. They are called pancha maha runas (five great debts) to clear which he has to undertake pancha maha yajnas (five great sacrifices). They are 1. deva yajna (sacrifice to the gods), 2. pitru yajna (sacrifice to the manes or forefathers), 3. rishi yajna or brahma yajna (sacrifice to the sages learned in the Vedas), 4. nriyajna (feeding the visiting hungry human beings) and 5. bhuta yajna (feeding the animals). There were no schemes of loan waiver or writing off of the debt in those days. It was considered that by performing these sacrifices daily, the householder is actually repaying the debts to the divine beings and the society from whom he has received help and sustenance. They also help him in offsetting the sins he might be committing knowingly or unknowingly during his daily life. Among these the first three types of debts viz.1. debt to the gods (deva runa), 2. debt to the forefathers (pitru runa) and 3. debt to the sages (rishi runa) are given priority which is called runa traya. The idea of three debts under which every human being is born has been found in the Rig Veda (8.32.16; 6.61.1), Taitriya Samhita (6.3.10.5) and the Satapatha Brahmana (1.7.2.11). The first type of debt is repaid by the performance of yajnas or Vedic sacrifices to the gods; the second by marrying according to dharma, begetting successors and doing shraaddhas to the deceased ancestors and the third by study of the Vedas. We are concerned in this essay with the rituals relating to the deceased forefathers for clearing pitru runa. The Sanskrit word ‘pitr’ becomes ‘pita’ in the singular and ‘pitarah’ in the plural; the former means ‘father’, the latter is used in several senses like forefathers or ancestors occupying their own world called Pitruloka. The most common meaning as used in Shraaddhas is three generations of ancestor’s viz. father, grandfather and great-grandfather. 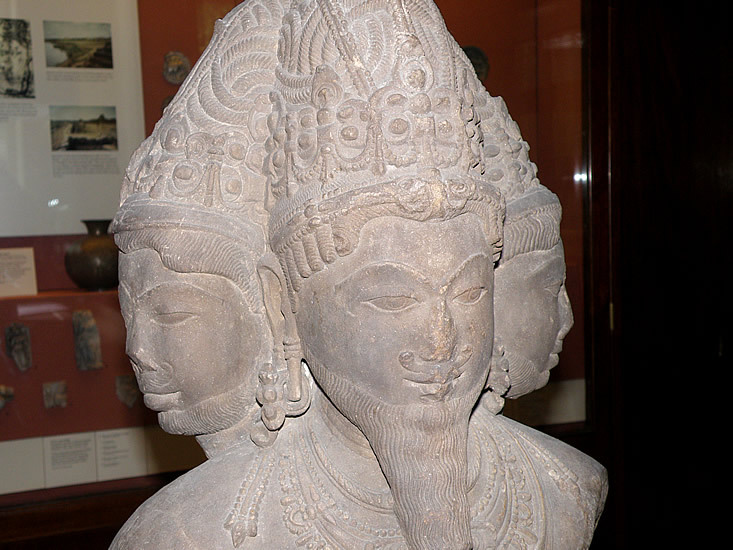 In Hinduism, the pitrus (forefathers or manes) are always respected. Normally, once a year at least, the descendents are expected to pay homage to them through religious rites known as ‘Shraaddh’. It is believed that even as the descendents are eager to appease their forefathers, the pitrus too are eager to receive such appeasement. The Markandeya Purana describes such instances of eagerness on the part of the pitrus to get good food (in the Shraaddhas), to receive oblations of water during Tarpans and to get a Shraaddha performed at holy places like Gaya. For these acts of offering them food etc. they, in turn, bless their descendents and are pleased if they become Vedic scholars and devotees of Vishnu. It is believed that during the performance of shraaddhas these pitrus accept the offerings by assuming the form of birds or by entering into the invitee brahmanas through their subtle bodies. In this context the following verse from the Bhagavad Gita where Arjuna laments about the ancestors losing their status on account of their being deprived of offerings to them is relevant. We find from the Upanishads and the Bhagavad Gita that the ancient Hindus believed in two paths by which the soul of a departed person could go either to the Brahma loka or to the Chandra loka. 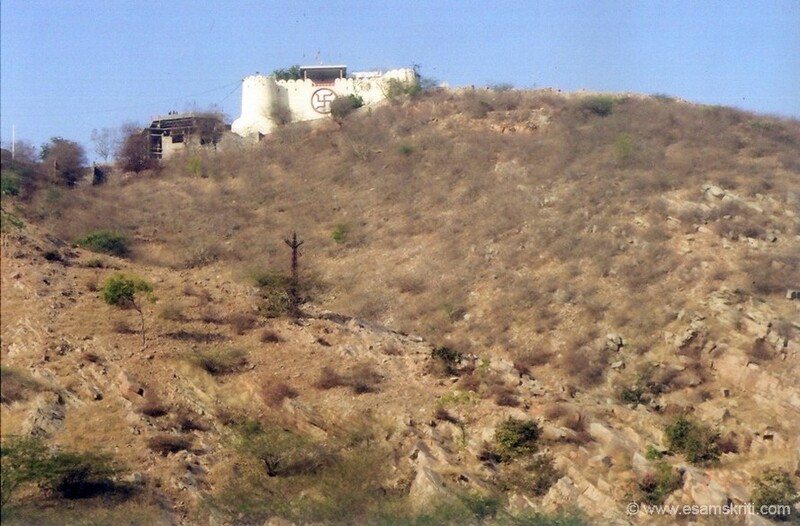 The former is called Devayana and the latter is known as pitruyana. The Rig Veda (10.14.2 and 7) mentions the pitruloka as a place where one’s departed ancestors live. The Brihadaranyaka Upanishad (6.2.16) considers Pitruloka as a station on the path of Pitruyana (the path of manes). The word ‘tarpana’ means satiating or satisfying. It implies the rites relating to satisfying the departed souls particularly one’s forefathers. It consists of standing in water after bathing in a river or tank and offering water thrice taking it in the joined palms of hand, with appropriate mantras to all beings of creation from Brahma down to the blade of grass. Manusmriti (2.176) says that Tarpan to devas, pitrus and rishis is a compulsory part of the daily routine of every brahmacharin. The water may be mixed with gingelly seeds (til). 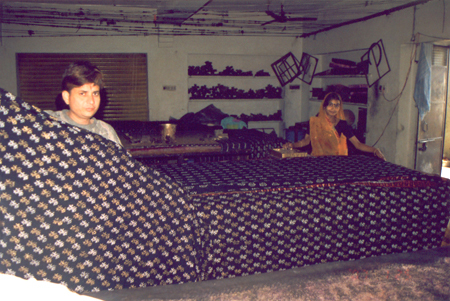 Tarpana is said to satiate the gods, manes and sages to whom it is offered. Hinduism considers death as a transition from one life to another. It believes that the disembodied soul badly needs help and succor from its descendents, not only during the period following the death of the physical body but also during its journey to the other worlds. It is here that come the role of the various rites performed immediately after death and also other rites that are repeated every month for a year or even every year thereafter. These rites generally go by the name ‘shraaddh’; the literature on the subject of shraaddh is enormous. The word ‘shraaddh’ is generally taken to mean after-death rites and subsequent ceremonies. ‘Shraaddh’ is performed by a competent descendent of the deceased ancestors with shraddha or faith. It is done for the benefit of three generations of ancestors viz. father, grandfather and great-grandfather. It has to be performed at the appropriate time (afternoon or aparahna) and place (preferably holy places like Gaya, Prabhasa, Prayag, Varanasi, Ujjain, Kurukhetra, Badrinath etc.) as determined by the sastras and family traditions. It may be accomplished by giving either cooked food or uncooked articles of food or gold or money to worthy brahmanas. 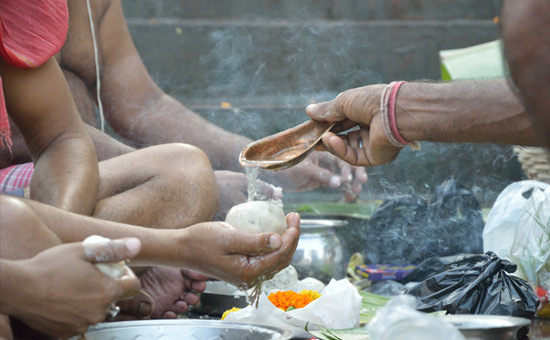 Generally for the majority of the people pinda daana – offering cooked rice-balls to the pitrus is very important in this ritual. The entire ritual is then dedicated to Lord Narayana with a prayer for forgiveness for the faults that might have unknowingly crept in. According to Ramayan when Lord Rama, Goddess Sita and Lakshmana were staying in the forest, Bharat met and appraised them about the death of their father. After hearing this sad news Lord Ram performed the ritual of Shrāddh for his deceased father. Pindapradaana or simply pinda daana occupies an important place in the post-death ceremonies. 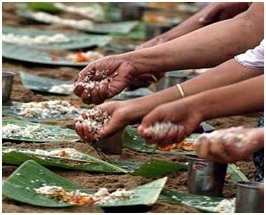 Pindas are rice-balls prepared by mixing cooked rice with other articles of food left over in the cooking vessels after the invitee brahmanas have been fed. Three such balls are made which are kept on the ground on a banana leaf or a dried leaf covered with darbha or kusha grass and til and offered to the three generations of pitrus (who are believed to accept them by assuming the form of birds (crows) or animals such as cows or through water in the flowing rivers like Ganga or sacred tanks and lakes like Pushkar or brahmakund at Kurukshetra or brahmakapal at Badrinath).